“Formulating for Efficacy™, the Software” is a computer program that helps you to identify the right emollients that will on the one hand dissolve your active ingredient(s), but at the other hand drive these chemicals into the skin. A schematic outline of the program is shown below. You start by entering a series of cosmetic emollients and other solvents (like water and ethanol) that can dissolve your active. An extensive list of around 100 cosmetic ingredients is provided with the software. You can enter your own ingredients if your preferred ingredients are not included. On the next page in the program you enter your active ingredient. Most companies will work with their own active ingredients and therefore the default list of actives provided with the program is reasonably small. You can enter your own active ingredients via SMILES strings. On this page, you also have to indicate a few other things, such as the oil/water phase ratio, the intended concentration of the active ingredient, etc. Optimizing your formulation but for what? You optimize towards the stratum corneum: this is what is normally done. Selecting this option will ensure that a large proportion of the active ingredient will penetrate into the stratum corneum. From there it will go further into the deeper layers of the skin such as the viable epidermis and dermis (as determined by the physicochemical characteristics of your active ingredient). You optimize towards the target concentration. This option (that can only be used when optimizing the ratio of existing ingredients) ensures that the concentration that you selected on the “Actives” page is close to the maximum solubility limit, to achieve the maximum drive to leave the formulation and enter the skin. On the right, you see the three choices that can be made towards the optimization of the delivery. In this specific case, the option “Optimize to Skin” is selected. At this moment in time, it may be necessary to do some experiments to calibrate the system, but this depends on the option chosen. All that is needed is to do some solubility experiments of your active ingredient in a range of emollients. This will adapt the numbers calculated in the program and improve the predicted outcome of the “Formulating for Efficacy, the Software” program. The last choice you have are the four main buttons in the picture above. If you have an existing formulation already and you are not willing to change any of the ingredients, but only the ratio of the chosen ingredients, you click the “Optimize selected ingredient list” button. This will identify the most optimal ratio between the chosen ingredients to ensure that your active will penetrate the skin. It may happen that one of your preferred ingredients will be thrown out. If this is not desired, you can fix that level, so that it will not be thrown out. The computer program will always calculate the best ratio of the chosen ingredients with the limitations that you decide. 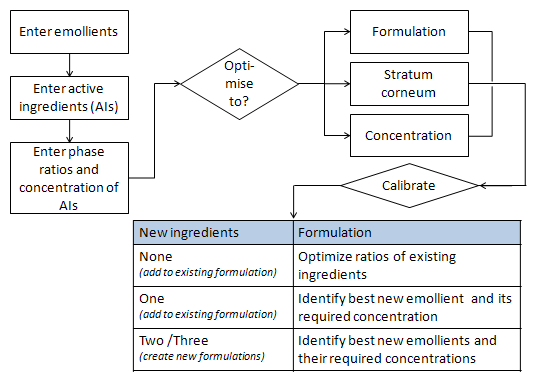 If you allow the computer program to add one new emollient to your formulation, it will identify the best ingredient to add (at your chosen concentration) that will optimize the formulation according to your choice (active, target concentration or skin). The result will normally be better than what you achieve when you only allow the ratio of existing ingredients to be optimized. If you do not yet have a formulation, you have considerable more freedom. By clicking the box “Find best 2 ingredients”, the computer program will calculate any combination of any two emollients in the system towards your choice (active, target concentration or skin). This normally results in an even better delivery of the active ingredient. But if an ingredient is identified that you cannot use (because of, for instance, company policy, price or availability reasons), then you can deselect this emollient and identify the second best option. The “Find best 3 ingredients” button works in exactly the same way, but takes longer as there are many more combinations to calculate (with 100 ingredients: 100 x 99 x 98 = 970,200 possible ingredient combinations) and on top of that every possible ratio of mixing these. In fact, it estimates the solubilities in almost one million phase diagrams and identifies the best ratio of these ingredients based on your choice of what you want to optimize. It is amazing that the program does do all this in about 15 seconds! Once you have completed this, you will have a system that in theory will deliver your active well but your formulation is not yet ready. You will need to enter your own surfactant system and stabilize the formulation, you will still need to optimize the viscosity, the preservation, the perfume, etc. But when aiming for top-of-the-world skin delivery of your active, this program puts you at least somewhere in the Himalayas. With current techniques (having five standard formulations on the shelf), you might be looking for Mount Everest somewhere below sea level in The Netherlands! The “Formulating for Efficacy™, the Software” program allows you to do a lot of different things. You can identify the best solvent for your active ingredient, but you can also do the opposite and prevent the penetration of a sunfilter into the skin. Once you have played, experimented and actively used the program, you will discover that it has multiple functionalities beyond skin delivery. The loss of Johann Wiechers was a blow to all of us. But FFE™ now has a lot of support from users and experts around the world and will continue to develop. The most recent upgrade, the powerful diffusion modeller, indicates how much more FFE™ can deliver. We look forward to hearing your comments on “Formulating for Efficacy™, the Software”. You really need to play with the program to identify all that it can do. Give it a go and let us know how your getting on.